Over 100 pairs of the nominate race of Wheatear Oenanthe oenanthe oenanthe breed each year on Fair Isle. The island provides plenty of the Wheatear’s preferred habitat: moorland or grass cropped well by sheep, helping them find their insect prey. There are also plenty of suitable nesting sites such as old Rabbit burrows and cavities in stone walls. Wheatears were colour-ringed on Fair Isle for a decade and were studied here as part of a PhD between 2008 and 2011. The Wheatear undertakes some of the most extraordinary journeys of a migratory songbird. Overwintering in sub-Saharan Africa, Wheatears travel hundreds or thousands of kilometres to reach their summer breeding grounds. The birds spend the winter in the dry Sahel zone of Africa, where they must find enough food to survive until spring migration. Some Wheatears travel to Alaska from East Africa via Asia - a one-way voyage of 10,000 km. The Greenland race (O. o. leucorhoa) – which is larger with longer wings than the nominate race and may be seen resting and fuelling on Fair Isle in the spring and autumn – flies from West Africa to Greenland and Canada, across the northern Atlantic via Europe. Spring migration commences with a period of fuelling. Food intake rates increase and the birds build up flight muscle and lay down fat, which will be used as energy to power long periods of flight. On the way, Wheatears stop at several locations in order to rest and refuel, before finally arriving at their destination. Timing of arrival is important; arrive too soon and there may be insufficient food for the birds to maintain body weight. Arrive too late and the best territories will have gone and it may be impossible to lay eggs quickly enough to ensure that the young are fed and fledged at the time when there are plentiful supplies of the insects that they eat. It is this issue of food availability that was investigated during the PhD study. By supplementary feeding randomly selected pairs of Wheatears and comparing their breeding success, survival and migratory fuelling with randomly selected 'control' pairs (i.e. not given extra food), the likely outcome of changes in natural food supplies could be estimated. Changes in food supply are a major way in which environmental changes such as climate change and land use change affect not only Wheatears, but other migratory birds too and in fact any organism in some way or another. Wheatears are a great bird to study to get into the detail of such issues for several reasons. For one thing, you can very easily see them! It sounds simple but is vital for following individual animals without needing to capture them whenever you want to know if particular individuals are still present. Which individuals survived the winter, when they started breeding and how many offspring they produced in a season were vital statistics for the study. Unlike forest species that are hard to spot because of all the trees in the way, Wheatears always live in open habitats where they could be spotted from a distance and their colour ring combinations recorded with the aid of a telescope, binoculars or camera. 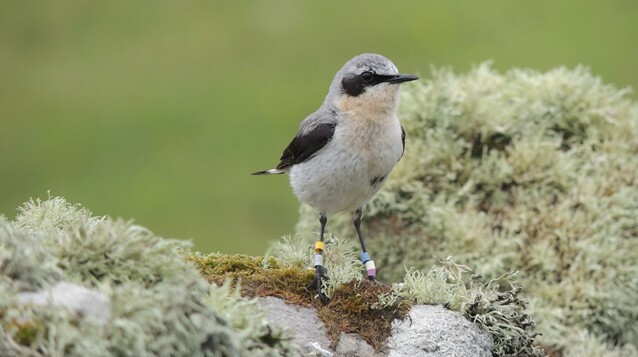 Being able to capture Wheatears and tag them with unique combinations of colour rings enabled them to be followed over several seasons without needing to catch them again. Fair Isle is an ideal place to study Wheatears. Blessed with a plentiful supply of Wheatears arriving each spring to breed, the island also has many extra pairs of eyes and experienced bird ringers who helped with catching and colour-ringing the birds and also spotting them again over the several years of the study. 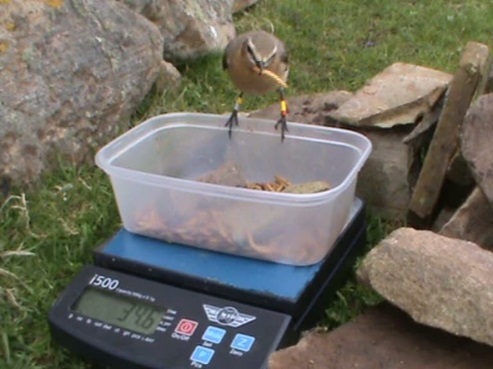 By feeding randomly selected pairs of Wheatears with supplementary mealworms, the study investigated whether key parameters such as survival or breeding success were being limited by the amount of natural food available. By having birds visit these feeding stations, it was also possible to weigh the birds by placing a balance under the bowl and filming these visits with a video camera. Each individual was of course recognisable once they’d been fitted with their colour rings. Supplementary feeding had no impact on the body reserves of Wheatears during the breeding season. Fed birds were, however, significantly heavier than controls between post-breeding and autumn departure. Birds leaving Fair Isle later for autumn migration departed with higher fuel loads than those leaving earlier. Timing of breeding was linked to departure timing, with earlier breeders beginning their migration sooner than those that started later. The mean flight range of Wheatears departing Fair Isle in the autumn was estimated to be 1,807 km - enough to reach Morocco. Further refuelling would then be required to reach their final destinations in the Sahel. Much songbird mortality appears to occur on migration. An earlier study on Black-throated Blue Warblers Dendroica caerulescens in the Americas by Sillett and Holmes found that over 85% of mortality occurred during migration. 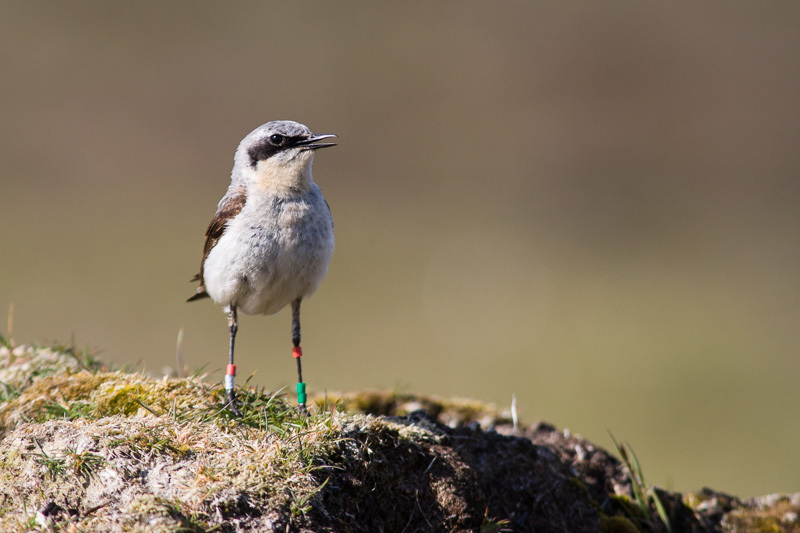 The feeding experiments on Fair Isle’s Wheatears aimed to assess whether changes in food supply at the breeding grounds could affect annual survival rates – the proportion of birds surviving from year to year. The impact of such changes could still be manifest during migration as they might affect the condition of birds setting out on autumn migration and hence their ability to survive the long and perilous journey to Africa. Although the food-supplemented parents did not raise any extra young per nest than the control pairs, some of them did go on to raise an extra brood, or – in the case of some males – raise a second brood with an additional female while also helping with the first. Young were no more likely to survive if their parents had additional food available. This suggests that at the time when most pairs had chicks to feed, food was plentiful and was not limiting chick development (food limitation of chick development can’t be ruled out, however). 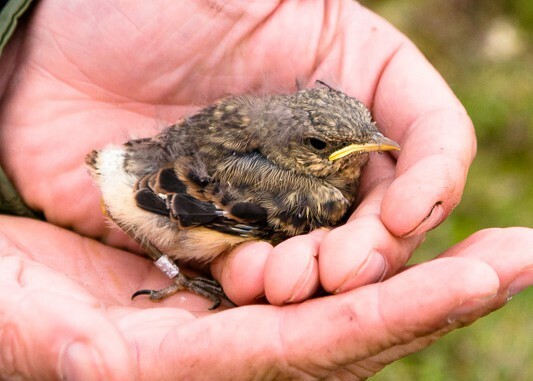 Once fledged, however, young that had access to supplementary food were 1.56 times more likely to survive to the next season – a huge increase. Both males and females contribute to offspring care. Breeding therefore entails a personal cost to both of them, which could affect their likelihood of surviving to the next season. Extra food led to a 1.22 times increase in adult survival rates. It seems as though the supplementary feeding may have helped the adults maintain their own condition, which in turn would help them see out the migration and wintering periods. Food availability drops off substantially late in the breeding season, which is the primary reason why migratory birds leave for distant wintering grounds in the first place. This study suggests that young birds are disproportionately affected; with extra food they survived nearly as well as adults. 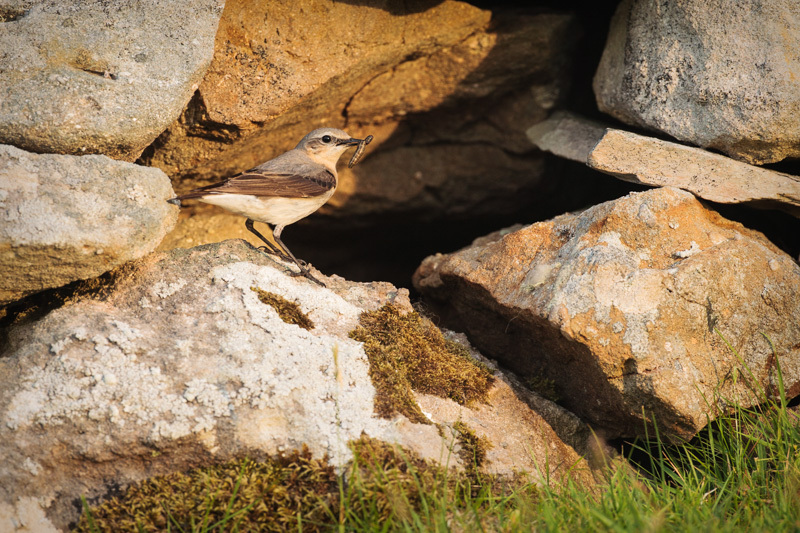 Environmental changes that affect food availability are therefore likely to affect young birds to a greater extent than adults; what will this mean for Wheatear populations in the future?